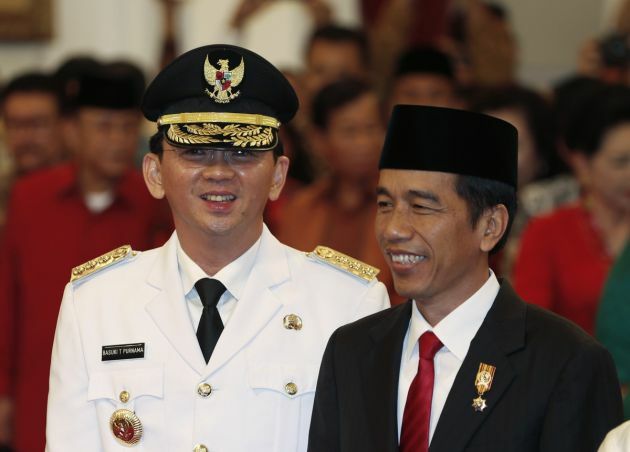 (Photo: REUTERS / Beawiharta)Jakarta Governor Basuki Tjahaja Purnama (L) poses beside Indonesia's President Joko Widodo after his swearing-in at the Presidential palace in Jakarta, November 19, 2014. Jakarta's first Christian governor in nearly 50 years was sworn in on Wednesday, despite protests from religious hardliners opposing a non-Muslim taking over one of Indonesia's most powerful political jobs. Indonesia's President Joko Widodo has sworn in a Christian with Chinese roots as governor of the country's capital city. Newly-elected Widodo led the ceremony as Basuki Tjahaja Purnama assumed office as governor of Jakarta, after serving in an acting capacity for several months. Purnama is the first person from Indonesia's ethnic Chinese minority to become a leader of Jakarta after working as Widodo's deputy during his term as governor of the capital, Agence France-Presse news agency reported November 19. Widodo, or Jokowi as he is called by his supporters, was elected to the presidency earlier this year. The election of Widodo and Purnama, virtually unknowns in the era of the late strongman Suharto, has been viewed as a sign of developing reforms since the fall of the authoritarian rule in 1998. But Purnama's assumption of the governorship is far from smooth. Hardline Islamic groups have protested for weeks, with some objecting to an "infidel" taking the reins of the state government in Jakarta. Some 87 percent of Indonesia's population are Muslims, while Christian make up only about 7 percent. Ethnic Chinese make up only some 1.2 percent of the country's population. The protesting Islamic groups seem to have found an ally in Purnama's political opponents in the city council who tried blocking his inauguration. Purnama is known as a hot-headed, frank governor. "You can't make everybody happy," he said after his inauguration. Observers say the bespectacled politician offers a stark contrast of leadership style to his predecessor. Purnama fondly called Ahok and is known to openly castigate blundering officials, a more abrasive approach compared to Widodo's gentle, persuasive style. Despite intense opposition to Purnama, some Jakarta residents are backing the governor. Among the problems Purnama will face are the perennial problems of Jakarta which include an inefficient public transport system and bureaucracy, as well the lack of flood defenses.